I loved, loved, loved this book. I’m really looking forward to seeing the new remake of the film but not sure how it will translate to the screen. 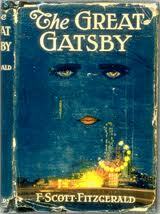 The Great Gatsby tells the story of the fictional communities ofWest and East Egg in New York. The narrator is a man called Nick Carraway. Early on in the book, he admits that “it was a matter of chance that I should have rented a house in one of the strangest communities in North America” He is the link between all of the characters, from his cousin Daisy and her husband Tom Buchanan, to the Great Gatsby himself, a mysterious figure, who lives right next door to Nick but for much of the early part is only referred to by name, and always with some strange and fantastic story attached. There are a couple of main plots throughout, which are all neatly tied together at various points in the story, and are all equally compelling. We have Tom and Daisy’s tempestuous marriage and rumours of an affair, to Gatsby’s regular, magnificent parties and who he really is underneath all the hype and scandal. I love the character of Nick, because he plays the part of the narrator, but not being directly involved in the story, he is in the perfect position to comment on the events and people around him. Having explained already that he finds the community strange, we can rely on him to take an impartial view of events and can relate easily to his descriptions. Daisy and Tom’s relationship is fascinating too, this is one of the things which is subject to rumour and scandal among the other characters, everyone having an opinion on Tom’s affair. The fact that we are quickly introduced to his mistress with whom he seems to lead a double life with their own friend’s separate from Daisy just makes this all the more enticing to read. These words conjure up beautiful images and for that reason alone, I will definitely be looking up further works by Mr. Fitzgerald. Even if the story itself hadn’t been so enjoyable, the words he used captivated me completely throughout and transported me to a different time and place. And that, to me is the reason I read. After just finishing the dire work that was Mary, Mary by Julie Parsons, this was a joy. I would absolutely recommend everyone to pick this up and have a read.